Denham colts entertained Chesham last night in a top of the table clash, with the lads knowing a win would secure them promotion, and depending on other results, the 4th Division title. Denham batted first and were able to set an excellent target of 100 from their 20 overs. Paxton William continued his good form and was able to expand on his attacking shots, making 21 before he was unlucky to be run out. Josh Simpson again batted well to make 30 retired, including a lovely straight six. Elliott Coggins was also impressive as he made 15. The running between the wickets was again good in difficult conditions, as it was raining heavily for the last few overs of the Denham innings. In reply, Chesham started steadily and put on 22 for the first wicket, however poor running between the wickets cost them a few runs. When the excellent Dan Treacy made the breakthrough in the fifth over with a caught and bowled, Denham began to take wickets at regular intervals. Dan picked up 3 wickets and Elliott Coggins and Jack Tomlinson each picked up 2. There was also a good run out from wicket keeper Sonny Comrie, who was excellent behind the stumps all evening, and a fine catch from Elliott Potter. Chesham’s innings finally ended on 86/8 giving Denham victory and promotion to Division 3. An excellent result for the team, which is reward for the effort they all put into this game and for the hard work they have done on improving their games this year. COME ON DENHAM!!! The under 13s played their 4th league match of the season at Penn & Tylers Green last night. Denham fielded first and started well, restricting Penn to 50/9. Josh Simpson, Dan Treacy, Joe Anthony and Jack Tomlinson all took two wickets. Once again the catching was good and there were no drops. Unfortunately Denham’s concentration levels dropped in the last few overs and this allowed Penn to post 84/9 from their 20 overs. Paxton William and Jack Tomlinson provided a steady start to the Denham innings reaching 24 before Jack was out caught at mid on. Paxton and Alex Wright continued the progress and took the score to 47 from 12 overs before Paxton’s patient innings came to an end for 7. Alex was then unlucky to be caught out from a nice shot for 5. Josh Simpson and Joe Anthony then proceeded to play very well and ran between the wickets brilliantly, upping the run rate considerably and move Denham towards their target. With the scores level with a couple of overs remaining, Josh hit a full toss for 4 to give Denham victory by 7 wickets. Josh finished 24 not out and Joe was not out at the other end. Another good win for the team. Denham bounced back from their previous defeat with a superb victory at home to Marlow Town on Thursday evening. Denham bowled first and took regular wickets with Joe Anthony, Elliott Coggins and Jack Tomlinson all picking up two wickets, including a fantastic caught and bowled from the latter. The fielding was excellent with catches taken from Josh Simpson, Liam McGuinness, Paxton William and Dan Treacy. Marlow were able to make 68 in the end mainly thanks to one of their batsmen who made 30 not out. The Colts needs to think more carefully about where they place their fielders for certain bowlers and certain batsmen and we didn’t defend this batsman’s strengths. The Denham innings didn’t start well as two wickets were lost before a run was on the board. A mention needs to go to Elliott Coggins who was extremely brave to continue batting after being hit in the chest by the ball at the non-strikers end. It was left to Paxton William and Josh Simpson to get the innings back on track. Josh continued his good form and hit two sixes on his way to 30 not out, but was also careful in his shot selection after a close shave early on. Paxton showed how much his batting has improved as he carefully defended the Marlow opening bowlers, then taking the runs where they were available, even hitting a six when the chance arose. Denham comfortably passed their target in just 11.4 overs with the loss of just two wickets. This has taken them to top of their division. Well done lads!! After two good wins, the colts produced a more disappointing performance away at Gerrards Cross. Batting first, Denham made 98 from their 20 overs which looked a decent total. Josh Simpson made 30 not out and he was supported well by the likes of Dan Treacy, Will Tomlinson and Alex Wright. However the bowling and fielding performance to follow was poor, with too many wides and wild throws at the stumps. The Gerrards Cross opening batsmen played very well, taking quick singles and forcing the Denham players into fielding errors. They were able to pass Denham’s score with plenty of time to spare and without the loss of a wicket. The Under 13s produced an excellent display to defeat Farnham Common in their first league match of the season. Asked to bat first, openers Alex Wright and Harvey Faulkner were able to negotiate the Farnham opening bowlers in the first few overs. This allowed the middle order to take advantage of the weaker bowling. Both Jack Tomlinson and Josh Simpson batted very well with excellent shot selection and put on 48 for the 4th wicket before Josh retired on 30. Jack continued to build the Denham total with help from the rest of the team and was also able to retire on 30. Denham finally posting a formidable total of 108/8. In reply, Farnham Common were never really in the game thanks to a much improved bowling performance from Denham. Wickets went to Jack and Will Tomlinson with two apiece, and to Dan Treacy, Elliott Coggins and Joe Anthony, each with one. Farnham ended their innings on 46/9 giving Denham a convincing 62 run victory. The under 13 colts side had their first match of the season on 9th May at home to Slough. A disappointing bowling display from Denham allowed Slough to reach 86/5 from their 20 overs. Of the 86 runs scored 61 of these were given away in wides and no-balls, so this is something that the boys will need to work on in the coming weeks. Josh Simpson took 3 wickets and Max Cambridge also chipped in with a wicket. In reply Denham lost both openers for nought before Josh Simpson (13) and Will Tomlinson (3) put on 26 for the 3rd wicket. Will continued to help build the Denham total with his brother Jack, and took the score to 35 before Will was bowled. Another quick wicket followed and Denham were in trouble at 35/5. Sam Simpson joined Jack at the crease and bravely hung around to help take the score to 61 before Jack was out for a well played 18. The game was still very much in the balance at this point as Dan Treacy came to the wicket. There were still plenty of overs remaining to score the runs so both batsmen played sensibly, choosing which ball to hit and which to defend. Dan played some excellent shots and both ran well between the wickets, finishing with an unbeaten partnership of 28 with Dan 14 not out and Sam 3 not out. Denham won by 4 wickets with 3 overs to spare. 25/04/14 - With the impending inclement weather this weekend, there is a strong possibility that the first session of the season will have to be cancelled. For anyone new looking to join the Colts section, please come along as James and David will be in the clubhouse, pen and paper ready to take your details. Any other queries please use the contact form adjacent and one of us will endeavour to get back to you as soon as possible. 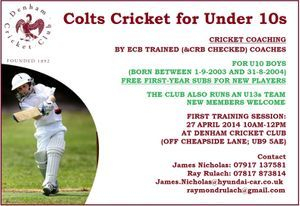 For those tech savvy parents out there, please follow @DenhamCC on Twitter.